The easiest way to decorate any bedroom is to stick to classic designs. They look in place with any matching furniture arrangement. If you do not want to spend days looking for single TV beds for bachelor bedrooms, just go with interior-neutral colours and monotonous upholstery types. Sure, not every bed will be upholstered, but most TV models will be. If you are looking for a solution that would look simple and impressive at the same time, go with leather. 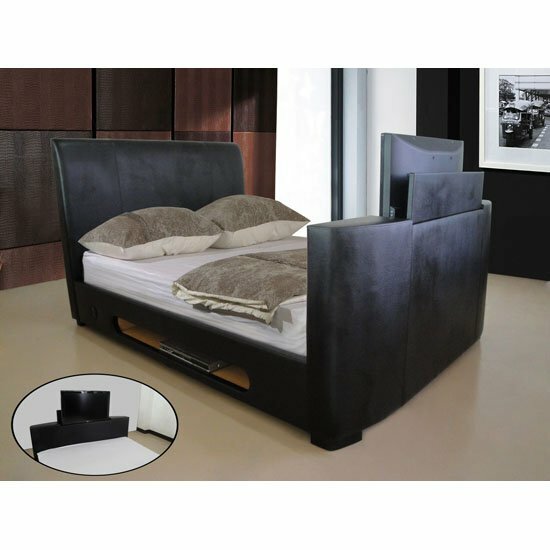 Another advantage of leather TV beds is that they will last for decades. Hard textiles and fabric upholstery, on the other hand, is a more budget-friendly idea. Sure, it will not feature the same looks, but if you choose mono-coloured fabrics, your bedroom will acquire a neat, simplistic look. Dark and light colours are universal; however, you can explore brighter shades for a more impressive effect. Ideally, you should take a good long look at a TV bed before buying. It is critical to check out the sliding mechanism personally — especially if the TV should slide into the bed frame. There are some budget TV beds without this flexible mechanism, but they are not the best ones on the market. If the bedroom is small, a TV that does not slide back into the bed may clutter the room. Storage is a common problem — not only for families and bachelorettes, but for the bachelors as well. So, if you are shopping for a new bed anyway, you might want to look for a piece that comes with hidden storage. Normally, it will either be a bed with drawers or a piece with lifting mattress. Once again, keep it simple. The simpler the design, the easier it is going to be to search for matching furniture units. Check out sales and seasonal clearances If you are looking for the best deals ever, sales and clearances can help you with that. Shop for new furniture in February and July — this is the time when the new items are about to hit the stores, and the old ones are being massively sold out. And finally, do not forget that the bed is focal attention grasping point of any bedroom. Here are some ideas that will help you decorate your bedroom for maximum exposure.